An acquaintance and I were recently talking about the struggles and stresses teachers face in the current education system, and what can be done to address these issues. First and foremost, I think teachers need to give themselves rest over the summer. We all know there’s still work to be done during this time, but you’ll at least have a break from the structure of the school day. And this is an important opportunity to spend time filling your tank back up before the beginning of the next school year. 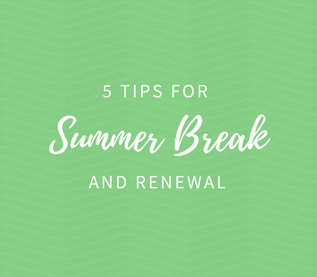 So, I created some tips for you to consider as you head into summer break. And yes, please heed the word “break”! 75% of job success is predicted by an individual’s optimism levels. Part of my work as an education consultant is inspiring joy and excitement in teachers and empowering them to pass it along in their classrooms. I’ve seen firsthand how this translates into measurable successes for both teachers and students and know that the potential for this kind of success-by-way-of-positivity is achievable in any field, for individuals of any skill level. If every workplace, every employee, took responsibility for creating a positive environment, they would likely see an increase in the level of professional and personal fulfillment—and successes—to be had. 2. Consider a Gratitude Practice. In other words, it’s not necessarily reality that shapes you, but the lens through which your brain views the world that shapes your reality. What the science of happiness has found is that if we can change that lens, not only can we increase personal happiness, we can also effect positive change in education and business outcomes. An easy and effective way to change your lens is through gratitude. Identify the things in your daily life for which you are appreciative and make note of them—write them down, share them with a friend, give them tangibility. I began this practice years ago when I was teaching. A group of colleagues and I were feeling a lot of negativity around our school and decided to create “The Grateful 5” to counteract it. Each member compiled a list of five things they were grateful for and emailed it to the rest of the group. This gave me the opportunity to get my own appreciative thoughts on paper—and to be inspired by the positivity of my friends and colleagues! My current practice is a gratitude journal where I write a list of 10 things I’m thankful for at the end of each day. And let me tell you: The power of the gratitude journal comes not in making the list when you’ve had a great day, but in being able to do it when you’ve had a not-so-great day! By acknowledging what you are grateful for, you begin to notice what’s going well in your life—and attract more of it. Yes, as adults we must make time for play. For me, play is taking a run, engaging in a game of hide-n-seek around the house with my beloved dogs, or enjoying a round of golf with my teenage son. Play can be many things. It might be signing up for a painting class, joining a prayer group or book club, registering for a membership at a fitness facility, learning a new skill or craft, going to a movie, or simply taking walks around your neighborhood. But here’s what I know, play is essential to our social skills, intelligence, creativity, the ability to problem solve and more. And it increases our happiness levels. This is backed by neuroscience, and it’s important to leading a healthy lifestyle. For me this summer, additional play includes going on vacation with my family to Yellowstone, taking time to put my hands in the soil of my flower garden, and continuing with my exercise program and daily meditation practice. When I do all of these things, I’m much happier, more productive, and I smile a lot more often. Now I must admit, I’m not the best person to speak about this subject as I’ve been averaging four hours of sleep per night the last few weeks. (This might be why my husband found me on the floor of my office this week having a good crying spell.) Despite this, I know that getting enough sleep and having some downtime are essential to my well-being. I’m currently taking a hard look at how out of balance I am when it comes to relaxation and rest. I need to spend some mindless time in front of the television, take some afternoon naps this summer, and make an effort to go to bed earlier. I am truly at my best when I am well rested. 5. Explore one new professional topic. We all know that some of you will begin planning for next school year the moment the kids leave the classroom on that last day. Shoot, some of you are already doing this! Yes, I know who you are—because I’ve been you. So, let’s think about this: What if you really did give yourself a reprieve from teaching over the summer, or at least a partial one? Perhaps you make just a couple of small commitments regarding your teaching profession. Maybe you read only one professional book this summer or attend one professional development workshop that might alleviate some of your anxiety at the start of next school year. If this is your cup of tea, check out my summer workshops at www.StrobelEducation.com or see my video clip below for a short summary.